Your first computer, do you remember it? For some of you, that memory might take you to the early 1980s, or even before. For some readers, it might take place in the early 2000s. Everyone is different. In that spirit, I corralled a great host of our editors here at TNW to share their first and early computing experiences. It makes for a very diverse and interesting read. The age of our staff varies wildly, and so the following stories are more than a bit unique. Enjoy, and I hope that you are taking the day off. It took my 12-year old brain a few minutes to process this as a visual. But when I did, I remember feeling terrified. I signed offline and was afraid to go back on for a week. After that, I gave up chatrooms and went through a pretty wicked SIM City addiction. When The SIMs came out in 2000, I played that for about 3 months straight. At some point I turned 16, got a car and then it was all about playing SNAKE on my sick Nokia 3510. My earliest computer experience happened with one of the first releases of AOL. My dad had installed it onto our desktop computer and explained to me how everything worked. I remember him being so frustrated by how long it took for him to log online. He explained how we shouldn’t be impatient because everything we had was so much quicker than anything that ever existed before. It’s funny how technology still feels too slow to this day. Will there ever be a day where I never feel the need to throw a computer out the window for freezing up? I grew up in France in the eighties, and my first computer experiences were based on French technology. 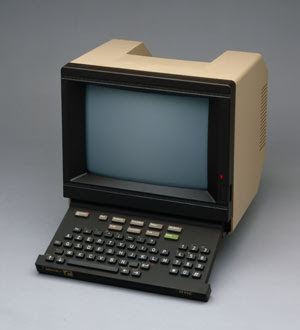 My first PC wasn’t exactly a computer; it was much better than that: a Minitel, a Videotex terminal that half of the French population went on to use. What it did was very similar to Internet: it let us access online services (banking, airlines, etc.) through our landlines. It was cutting-edge technology at the time – and some people still use one to this date. For French geeks slightly older than me, it meant message boards, but also adult chat services and the infamous “Minitel Rose”! Me? I was just a kid and online services were quite expensive, so I mostly remember using my Minitel to draw offline, and as a free phone directory later on. I remember we also had a computer room at my elementary school in the early nineties, as part of a plan from the French government to promote computer use. As a public program, it was powered by French computers, made by manufacturers such as Bull and Thomson, though the one name that stuck in my mind is Goupil. What I didn’t know until today is that what I remember as a somewhat difficult computer game involving giving directions to a tortoise was actually programming for kids. The language is called Logo, and you can read more about it here. Sounds like I was made to be a tech journalist! My first computer was a Sinclair Spectrum +1. This was around 1991 and the Spectrum was at the end of its life. For some reason, I swapped my mountain bike for the computer and a box of games on cassette tapes. I was ripped off, looking back but it seemed like a great deal at the time. While loading games fom cassettes was a slow, frustrating experience, looking back it made me appreciate the games once they had loaded – even if they were badly coded at times. Jet Set Willy was a classic but famously unfinishable. Meanwhile, Spellbound Dizzy, one of the final big Spectrum releases, but it had a bug which meant you couldn’t pick up an important item – at least on my copy. While I wouldn’t want to go back to the tape-loaded software days again, one thing’s for sure – the sound that the code loading off tape made was brilliant. I can’t really remember what the first computer was that I had a play with, but my Dad introduced me to it. He was an old school COBALT programmer (after he retired from the police force). I know it was one that had two massive floppy drives, and required me to switch disks every other second it seemed. But it was amazing. The idea that I could type things on a keyboard and those commands would be beamed to a screen was magical. My first real computer experience was one that we bought from a friend who built them from scratch. 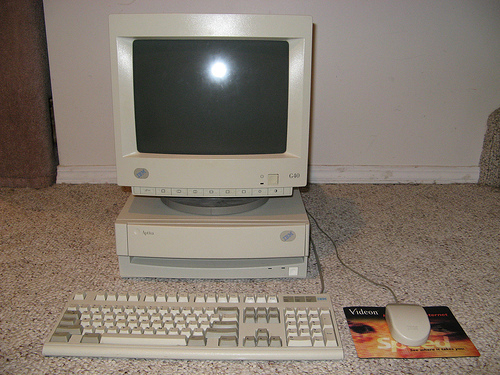 It ran DOS with a graphical interface (nothing more than a menu system), had a hard drive, color monitor, and a modem. While my Dad played games like Leisure Suit Larry and boardgames, I wanted to know what the modem did. My dad set me up on a BBS, and that was my first online experience. He showed me how to play games, but all I wanted to do was talk to people so I’d patiently wait for someone to come online. BBS’s usually only had 2 phone lines, so I’d take up one just to wait. When someone logged on, I’d hit them up with a message right away and most of the time they wouldn’t respond. I once fried a modem by staying online through a thunderstorm so I bought another one and installed it myself at age 12. Once AOL hit our doorstep, I was ready for the social web. I remember that we bought a CD-ROM drive just to install AOL. It was a glorious day. 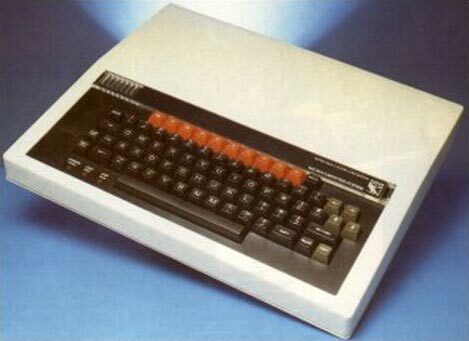 The first computer I ever owned was an Acorn BBC Micro (model B) which was more than ten years old when my software engineer uncle gave it to my brother and me. He had copied hundreds, if not thousands of games and programs for us, which were loaded onto a box full of floppy disks that ran on the machine’s bootable drive. The BBC B was an incredible machine, looking back. While my friends had a far superior experience on their Commodores, my brother and I were happy in the knowledge that we had more games than we could ever get round to playing…and it proved to be so. We subsequently moved on to console gaming with the NES (and later SNES) while my dad bought an Amstrad, but every once in a while, we’d still go back to tinker with the BBC B.
I forget what form of Mac it was, but it looked like a Apple IIGS, only without a color screen. That’s if I recall properly. Memories that far in the past are shrouded in cloud. Whatever the case, I loved the machine like it was my brother. Actually, given how I fought my brother to use it, I may have loved it more than him at the time. Pong. That damn maze game. Hiding stuff in folder trees and racing to find it. I spent days on that machine, doing nothing and learning everything. Sometimes I wonder if ‘digital nativity’ is simply a number of hours spent tinkering with computers, learning how to solve problems on one’s own. I think so. It’s ironic that I’m a PC now, but my roots are completely Mac. Everything changes. Those are our stories. The comments are yours to tell your own. Image credit one, two, three, four, five, six, seven.